Self-myofascial release, also known as “foam rolling,” has transformed from a once mysterious technique used only by professional athletes, coaches, and therapists to a familiar everyday practice for people at all levels of fitness.Recent information, technology, and affordable products have introduced an increasing array of training and recovery methods to the average person. Top photo: Calf bottom. Bottom photo: Calf top. Trigger points are specific “knots” that form in muscles. They are unique and can be identified because they will refer pain. Pain referral, for our purposes, can most easily be described as the pain felt when pressure is applied to one area of the body, but the pain is felt or radiated in another area. A common example of a trigger point is felt while foam rolling your iliotibial (IT) band as it causes pain to radiate up to the hip or all the way down the leg to the ankle. When rolling or working on tight/sore muscles you will experience discomfort or pain. Think of it like the pain you get while stretching. It should be uncomfortable, but not unbearable, and when you are done it should feel better. Top photo: Chest – front delt. Bottom photo: Lats. For many, deep tissue massage is easy to understand. Ideally someone is able to work out the knots in your muscles, and it is commonly known this process may be uncomfortable and at times painful. Self-myofascial release provides the user the ability to control the healing and recovery process by applying pressure in precise locations, because only you can feel exactly what is happening. It is always recommended to consult with your physician or physical therapist for therapeutic/sharp pain and receive approval before starting self-myofascial release. For most people you will be cleared immediately and your doctor will encourage the practice. Top photo: Hip adductor. Bottom photo: Hip extensor – glute. Top photo: Bottom flexor. Right photo: Inner quad. Deep compression helps to break up or relax tight muscles and adhesions formed between muscle layers and their surroundings. Imagine you are tenderizing your own muscles. They should be soft and supple like a baby’s muscles. However, if our muscles are not taken care of properly we can experience loss of flexibility, adhesions, and painful movement. The compression allows normal blood flow to return and restoration of healthy tissue. Our bodies naturally want to be healthy and strong, but sometimes an extra boost is needed to achieve optimal muscle and tissue health. Top photo: IT band bottom. Bottom photo: IT band top. Areas to focus on can be identified in two different ways. The first is through screenings. 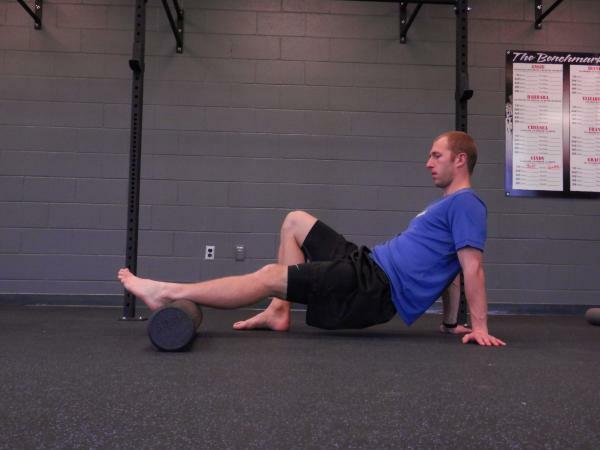 If you have followed the last two articles – squat screening and hip hinge screening – and have had struggles with either movement, you should include foam rolling in your workout and recovery program. You may target specific areas/muscles that relate to the movements you are focusing on. If after using the foam roller your movement improves, you have a more specific strategy to follow. Secondly, trigger points and tight muscles can be found through self-exploration, utilizing the list of techniques below and exploring each one. To foam roll properly, apply moderate pressure to a specific muscle or muscle group using the roller and your bodyweight. You should roll slowly, no more than one inch per second.When you find areas that are tight or painful, pause for several seconds and relax as much as possible. You should slowly start to feel the muscle releasing, and after 5-30 seconds the discomfort or pain should lessen. If an area is too painful to apply direct pressure, shift the roller and apply pressure on the surrounding area and gradually work to loosen the entire area. The goal is to restore healthy muscles – it is not a pain tolerance test. You may also use other objects to work on muscles such as a tennis ball, lacrosse ball, Theracane, or Trigger Point Therapy Kit. Top photo: Lacrosse ball – hip. Bottom photo: Lacrosse ball – shoulder blade. Top photo: Mid-back. Bottom photo: Upper back.